On January 2, the ship ‘Seabourne Pride’ from the Bahamas, carrying 200 European and Asian tourists docked at Tien Sa Port bringing in the first international visitors of 2013 to the central city of Da Nang. Visitors were guided by tour agents to visit the ancient capital of Hue in Thua Thien-Hue Province, the ancient town of Hoi An in Quang Nam Province, Cham Sculpture Museum and Ngu Hanh Son in Da Nang City. The Da Nang Tourism Department said that under the plan, in the first quarter of 2013, Tien Sa Port will receive 48 cruise ships with more than 44,500 tourists. The tourists will visit and enjoy various beauty spots and historical relic sites in the central provinces. In 2012, the total number of visitors to Da Nang amounted to 2.7 million, an increase of 12 percent compared to 2011, with revenues touching VND6,000 billion. Previously, the central city of Da Nang welcomed the first international flight from Singapore at its international airport on January 1. The Silk Air flight had 126 international visitors on board. 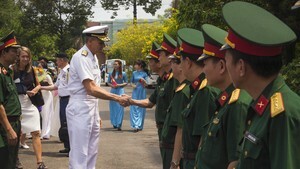 On New Year’s Day, Da Nang also welcomed another group of 80 visitors from an Indian naval ship. In 2012, air travelers to Da Nang alone reached around 157,000, up by 236 percent compared to the previous year. With the opening of nine new air routes, Da Nang aims to increase the number of international tourists to the city in 2013 by 20 percent from last year.